I watched the anime for Black Butler a while ago, and I thought it was really great. I know that Yana Toboso did the character designs for the show, and it follows much of what I've read in the manga. I should like them both equally, but I think the manga is superior. Firstly, Yana Toboso's illustrations are lovely. The panel layouts are inventive and seamless. 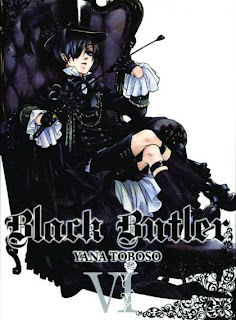 Often when I'm reading manga, I flip back in order to catch something I missed, but with Black Butler, I flip back to examine a scene and its drawings and to ask myself why did the mangaka choose to show this or that to lead up to this or that? The characters are always in motion and nothing seems wasted, not a facial expression, a movement, an artifact. Secondly, there is something lighter about the manga. Ciel and in Sebastian seem more gentle and more affectionate despite their contract. Thirdly, the story lines are also imbued with this gentleness. For instance, the curry cooking contest featured in Volume 5 and in the anime are different. The queen is funnier in the manga; no one gets possessed by an errant chef's evil curry. The story focuses on Agni and how far he will go to serve Prince Soma, well, what great curry he will cook. It lingers on Soma's desire to mature. And, these characters, who I really adore, actually stick around in London, after their story is complete. Volume 6 diverges from the anime altogether and follows Ciel, Sebastian and one of the reapers to the circus to investigate missing children. All of the original members of the circus are amputees, with custom made prosthetic from a workhouse they were all conscripted to as kids. 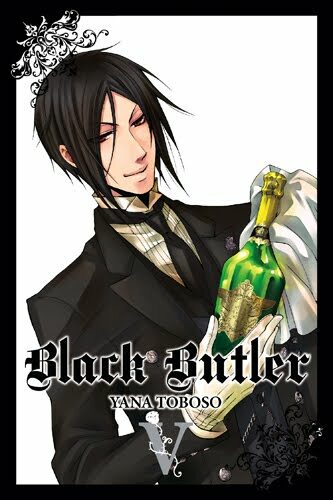 Sebastian is terribly adorable in this story line, as he can't stay away from the trained tiger. And, Ciel seems more vulnerable. If you're not reading this series yet, I suggest you get started!